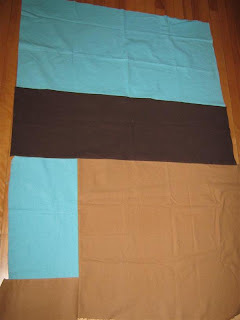 The only difference in my planning here is that I'll be strip-piecing and that my blocks will be 16" instead of 12". I played around with some colours, which is always my greatest challenge in making a quilt, as it's the only step (apart from designing a pattern variation and quilting patterns) that requires creativity and can't be undone if it turns out ugly. Well, it can, but that'd be a HUGE waste of time and effort. 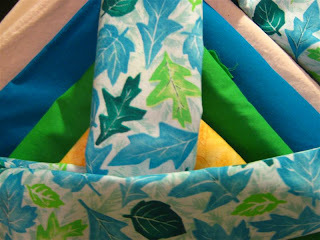 I like the blue-green leafy fabric tying the other colours together. 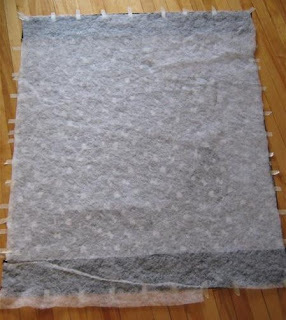 I bought it at a quilt show and have been wondering ever since what I could possibly use it for... 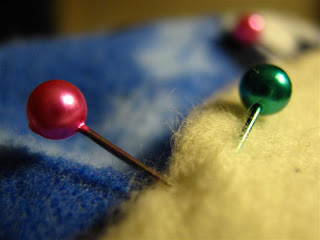 I matched the green and turquoise/blue, and once again opted for a non-pure-white variation: muslin. I had first envisioned a gradient of greens or similar, going from a dark center to a light outside, but the fabrics in my stash didn't really work for that. I was also missing a bit of a kick in the block, with just blue-green-white as colour scheme, so I played around with some orange-yellow colours, and that really gave it a boost. I didn't want to use the same fabric throughout, so I've scooped out 9 different yellow-oranges that'll be the center on the different (30) blocks. I think I can picture that in my head and like the final product. 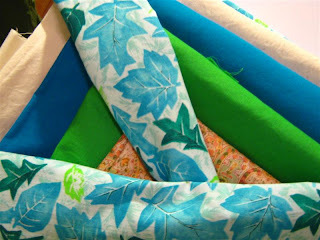 And because all the colours are so fresh, I'm calling it my Spring Quilt. Here are just three examples of the different centers, and I'll decide later if I'll use the second fabric, as it doesn't pop as much as the others (which might be nice in the final quilt, we'll see...). Cheerios and thanks for visiting my blog!!! I appreciate all your comments! Spring has come and gone, Winter has returned. 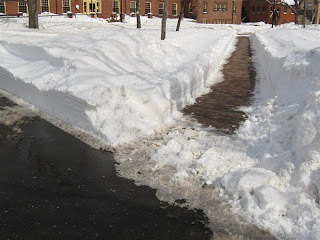 After a 10 C degree, sunny weekend, we were pounded by 30 cm of snow yesterday. It never stops, apparently... at least not in Canada. 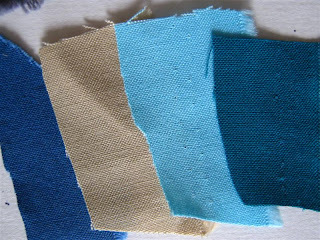 It was a short day at work, thanks to the storm, so I spent the extra time - what else... - fabric shopping. I've started a little design book and doodled around with ideas for quilts. 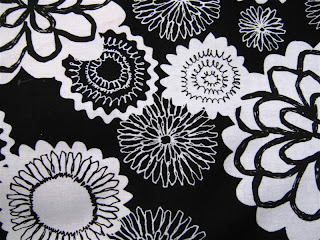 Now I'm motivated to get going on some new patterns, as well as finishing the disaster quilt and the oriental quilt. In fact, I have a question about the oriental quilt. 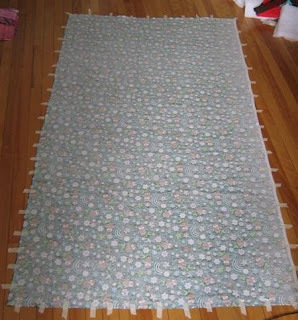 The only thing missing is some applique pieces on the quilt top sashing. 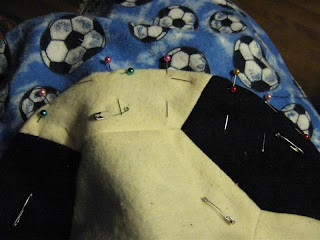 Is the general way to applique before or after quilting? 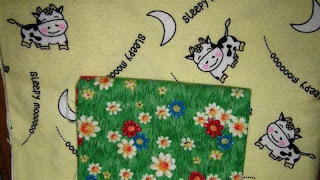 I will probably stipple the quilt, unless I go for a straight line design, and am wondering if it's easier to quilt first, then applique, because that way the quilting won't be interrupted by the applique (i.e. it will disappear below it instead of going around it). Any ideas? 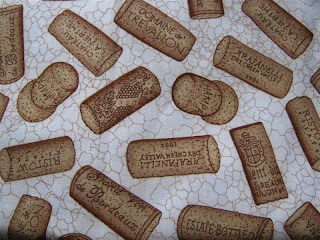 Anyway, the fabrics I bought are mostly solids as I am planning a bento box quilt like this one, and also feel inspired to copy this quilt from a quilt-along on Elizabeth's blog Oh, Fransson! 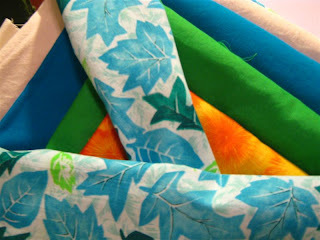 The solids are coarse, because they're pure cotton sheeting, but I like them as backing or for a heavy-fabric quilt. 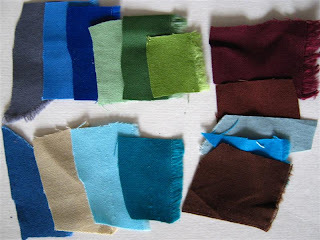 I think I'd like to use this ones as the solid colour in the quilt-along quilt - I like Elizabeth's colour scheme so much, that I will reproduce it instead of choosing new colours. 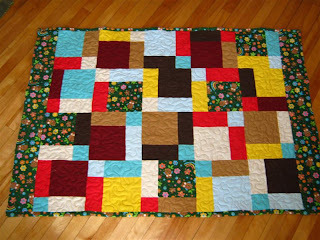 From looking at her other variations of that quilt, I will probably make the quilt at least twice! 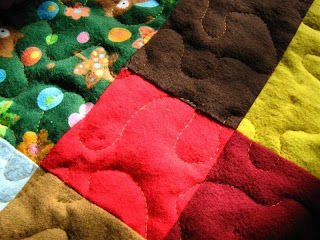 I like to make quilts that don't have the same pattern throughout, though there are many gorgeous ones out there. It's based on a block I've seen on The Quilter's Cache website, called Crossed Road to Oklahoma. 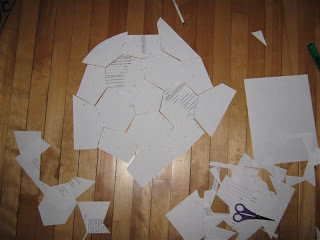 When I just looked the site to cite it here, I realized that Marcia Hohn provides the pattern. Oh well, I had fun spending a couple of hours last night figuring out how big I want to have my finished blocks be and how I'd do the pattern. I will actually do it slightly differently from Marcia's instructions. As you can see, I'm pretty much following her colour scheme, except with solids and beige instead of white. 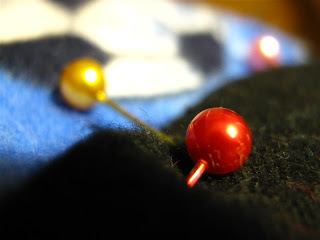 I may still substitute a pattern for one or two of the fabrics, if I have enough. 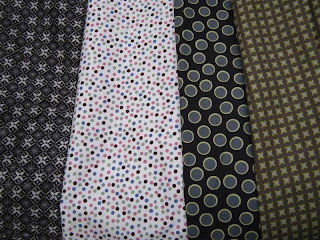 And then I bought a few fabrics that will be nice for binding or in a baby quilt (the dots), and borders on quilts like these ones. Well, I finished the binding on one of the quilts last weekend - there's only so much you get done when the weather is nice. 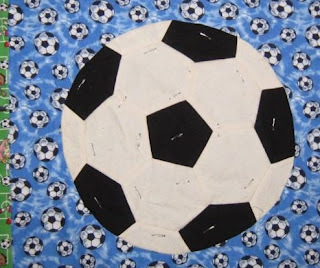 I'm going away this weekend but am taking the vampire and soccer ball quilts with me to bind. 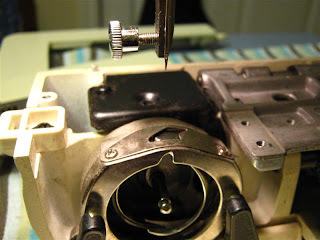 I just have the hand stitching part left, oh, and I guess the label... can't forget that! 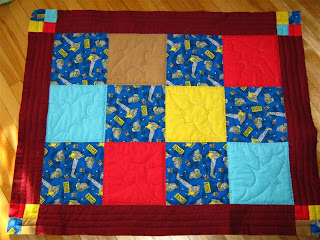 And one quilt that I actually finished last weekend, binding and all, is the owl quilt. 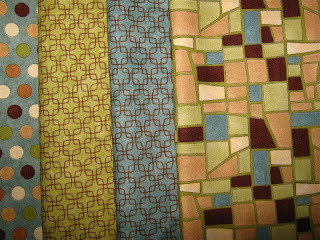 Nonetheless, this is another quilt that turned out to my liking. 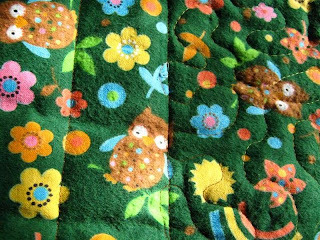 I got to experiment with my first disappearing 9 patch, got to use the cute owl print (of which I have very little left now) and one of my friends will have a lap quilt in the near future. 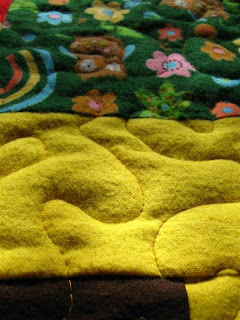 I was "uncreative" on this one and just did stippling, but I like it for the wavy 3D effect it gives the quilt. Did paralell lines again for the border (top and bottom). Though I didn't know that March 21 was National (US?) 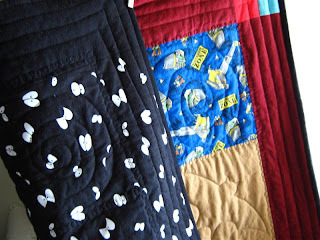 Quilt Day, I spent a lot of it quilting. 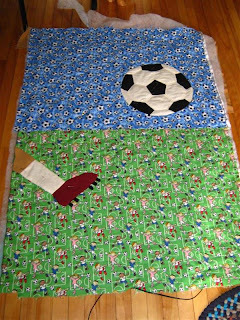 Before fixing the soccer ball disaster, I needed to do something easier and straight forward, so I finished the quilting on the vampire quilt for nephew nubmer 2. 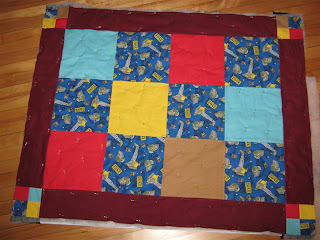 I started by outlining all the blocks with wonky loopy-loops - very easy and have a great effect on a kids quilt I find. On the border, I just did paralell lines all the way around like a frame. 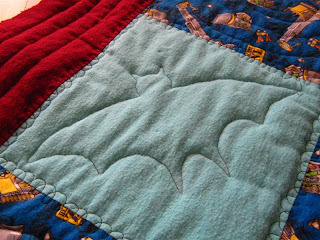 I decided to machine-quilt bat outlines on each solid colour block; just drew them on by hand as I couldn't be bothered to make a template. The blue construction zone fabric is so busy, that a bat would just have been lost, so I did snail shells instead, basically spirals with an oval at the end, so they look more like snails. 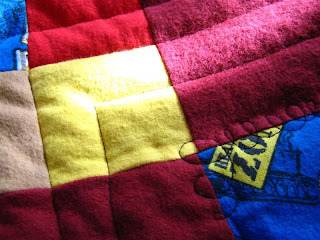 The overall effect is quite satisfying for me, and I have to say that this quilt definitely came off without a glitch. One of these nights, I'll test the full effect of the glow-in-the-dark eyes on the back :) I like how the spirals and border lines came out on the back. Ah, it feels good to finish something and have it turn out to your liking! Welcome Spring! Ah, the more I look at my last entry, the more I'm horrified about the quilt top. What was I thinking? 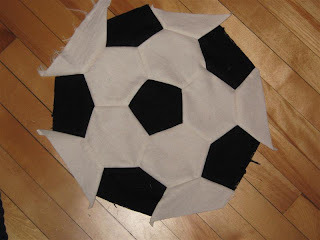 If you have suggestions how to save this that don't involve undoing the soccerball quilting I've completed already or unpinning the rest of the quilt, they'd be incredibly welcome. Maybe I could gift it anonymously??? ... ?? 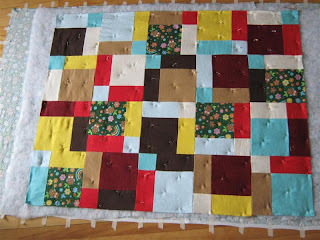 I zoomed right along and pinned the whole quilt. 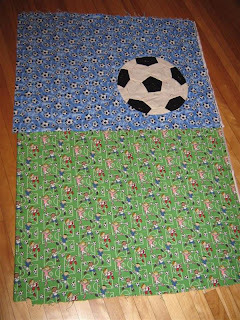 Now, I'm not really happy with the top, it's totally empty, and I think I might add some applique, but to be honest, I don't want to make this quilt a year-long project, and I wonder if the little guy will just think it's a cool soccer quilt, anyway? Just because the quilt doesn't satisfy my grown-up feminine aesthetic doesn't mean a kid won't like it, right? I'm thinking about maybe adding a 3 or 4 curved strips to add some flying motion to the ball, you know, like you see in cartoons. 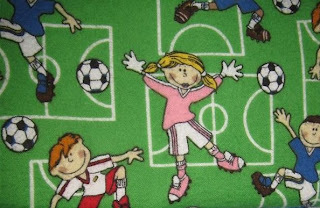 But the coolest thing would be a person on the lawn of course, a main player so to say. Oh, but will I get this done on time? 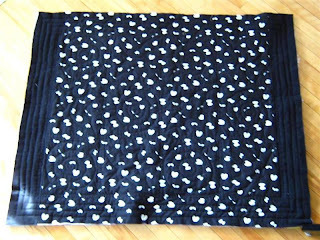 Here's the backing, just pieced out of left over flanelette from all my kiddie-quilts. 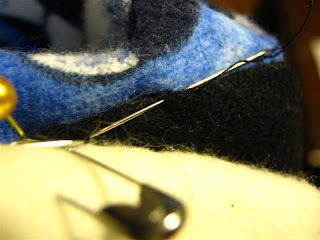 Ah, and then the true quilter came through... it was 10:30 pm, and I just wanted to carry the quilt from the living room, where I pin, to the little quilt room I have. It was all neatly folded to be added to the other pile of pinned quilts waiting for quilting. 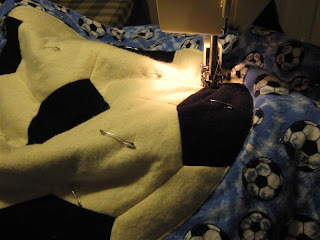 That pile is growing because my machine doesn't have a way to lower the feet, so everytime I want to do free-motion quilting, I have to take the machine apart and remove the whole structure with the feet. 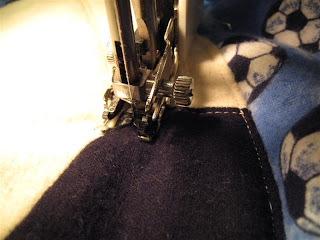 Bit of a pain, therefore I try to do as much free-motion as I can at once before switching back to directional sewing. 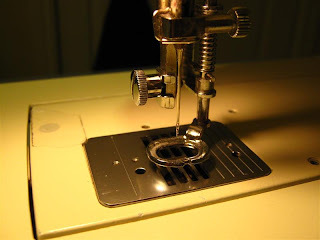 Now, because of all the pink-quilt sewing and flanelette sewing, there was a lot of fuzz in the machine, and it was time to clean it, so when I put down the quilt, I thought: "Oh well, I might as well clean and oil the machine tonight and switch the quilting foot and then I'll be ready for quilting tomorrow." 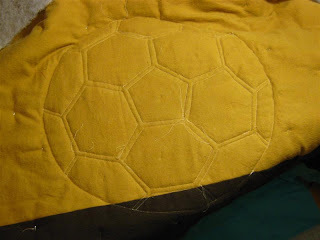 I quilted once around the ball, then on each side of the seam using cream-coloured thread that would show up nicely on the black. 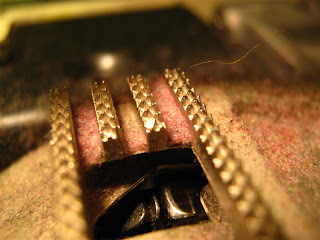 Then I took the machine apart for cleaning and oiling... look at all this pink fuzz! Yep, and that's the danger of entering the quilting room on my way to bed! In true quilting fashion, I took the quilt top with me to do some hand stitching in the hotel last night (part of that worktrip I mentioned in the last blog entry). 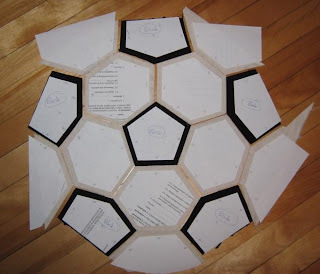 and am planning to hand quilt around the hexagons and pentagons anyway. 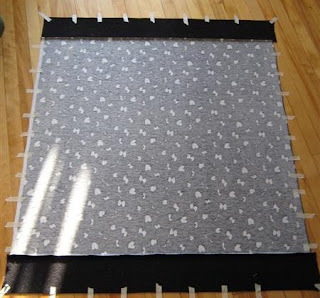 I'm afraid I might get sick of panels if I ever go through with all my panel quilt plans, but I'd like to use this fabric for a quilt like this hopscotch one by Amanda Jean at Crazy Mom Quilts. I bought the red fabric to be the stand-out fabric similar to Amanda-Jean's orange block amongst all the pinks. If anyone has better suggestions for a quilt, please send them my way. 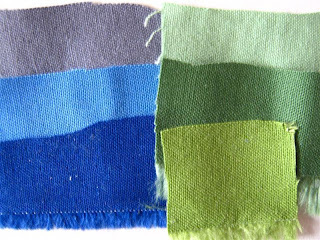 I have 1/4 m of each fabric. 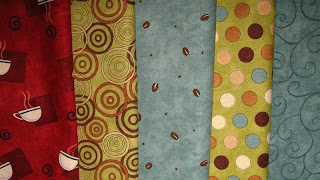 Ahhh, fabric shopping makes me happy!!! 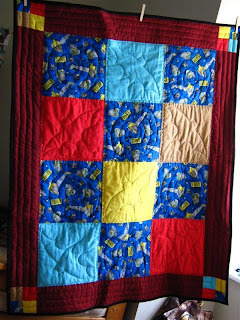 Oh dear, I just checked out one of the updated blogs on my links (to the right of this), and looked at a comment, and followed that link, and found a new quilting blog, which recommended two good quilting blogs, which had comments and links to more quilting blogs, and now my list of blogs I check out has doubled, oh dear. 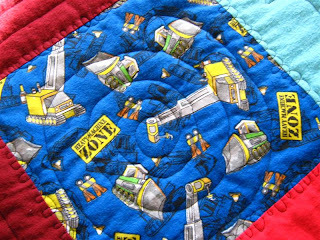 Soon my quilt blog-reading and -blogging will compete with my quilting :) I'm so impressed by AmandaJean's Crazy Mom Quilts blog - I've seen so many recommendations for her blog on my browsing sprees, and I honestly don't know how she manages those 100+ comments she gets on her entries. The last time she had a question about a quilt pattern idea, there were 183 comments (last time I checked, anyway). That's just so impressive! 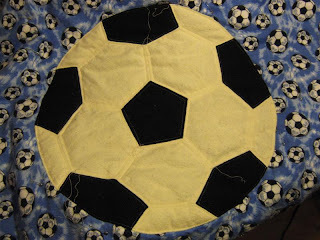 Anyway, in terms of quilting, I'm in the process of making the soccerball into a round shape and sewing it to the (very very simple top). I've put a back together also, just from some leftover flanelette pieces - love the colours, and almost like it more than the top ;) Photos to follow. 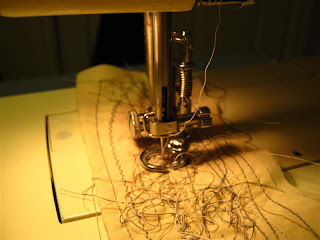 I spent last night busily sewing away. My first time piecing, hmm. I think I overdid sewing the corners together for the mitering, but I guess there's no harm in that. I like the result, I think it'll be pretty flat once I iron it, as well. 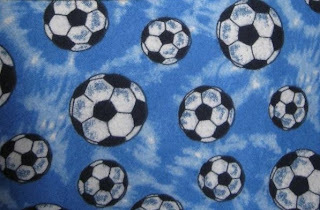 and I've changed my mind on the blue soccer ball fabric, that'll be a border or worked into the back (I had planned to use as the light patches on the soccerball, but I like this realistic version much better). Two of the three small quilts I was planning/working on are nearing completion! 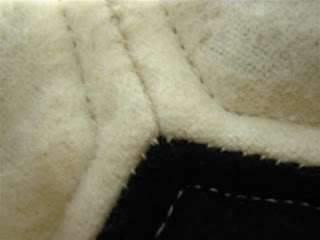 The overlap of the backing flanelette will be folded around for a border on the top and bottom, and binding. 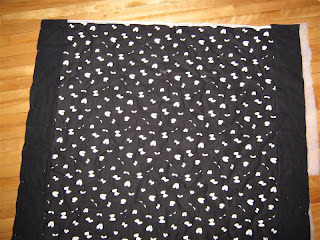 I also finished the backing for the Vampire Quilt, as well as the borders around the top, and pinned that all together. I checked, and the eyes do glow in the dark, it looks pretty cool! 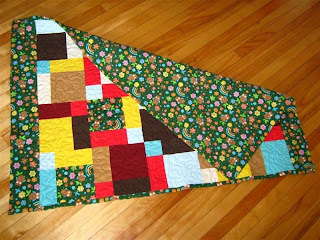 For both of these quilt, I ended up piecing batting together, and I tried CrazyMom's method of stitching the edges together instead of simply overlapping them. It's working okay so far. Some Pink Strategy-Rethinking? Help please!